Sometimes, you just have to rip it all out and start fresh — and that’s exactly what we did with this southern-farmhouse-style home. Fortunately, this spacious structure had more than enough room to do just that. 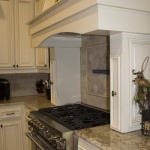 In this exhaustive and detailed remodel, few surfaces went untouched. 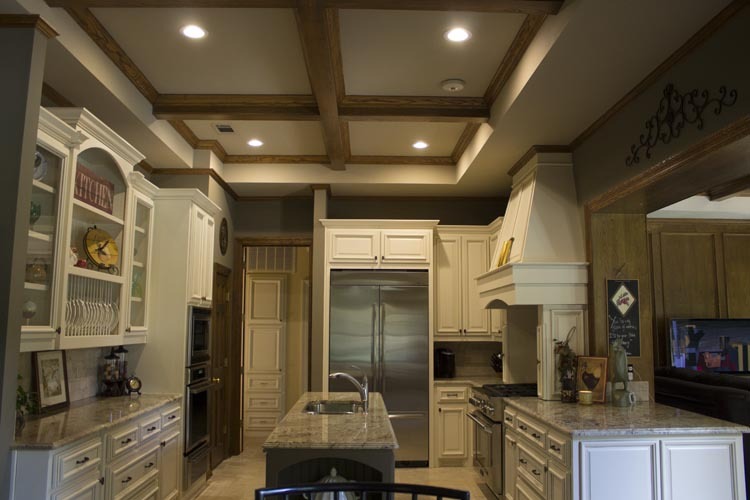 We began with the kitchen, and the goal here was a stretch back to Southern farmhouse tradition — large, open, breezy homes, with light, airy colors and simple color schemes. 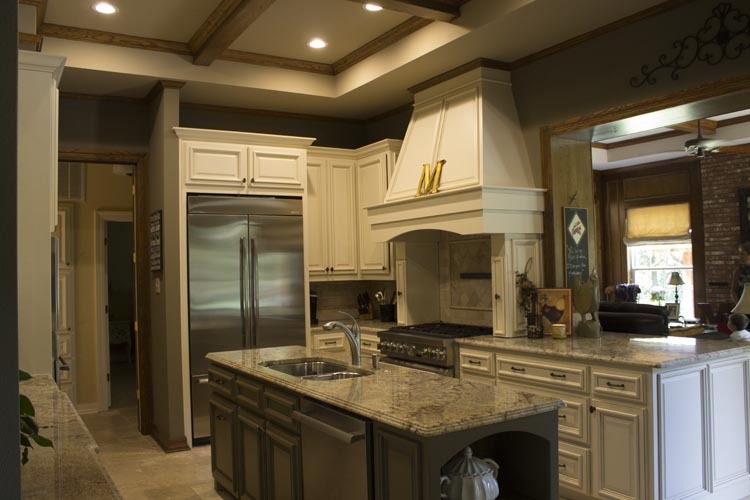 Between handy, hidden spice drawer pullouts and a classically styled oven hood, the focus was bringing the feel of Texas farmhouse kitchens of the past into a beautiful melding with the modern appliances and conveniences of the future. 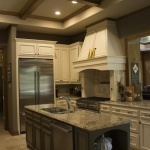 Granite countertops and marble tile backsplashes seal the deal, adding a sweet touch of luxury to an otherwise-simple layout, hearkening back to an earlier time. But that’s not the only bit of the kitchen that got a makeover! 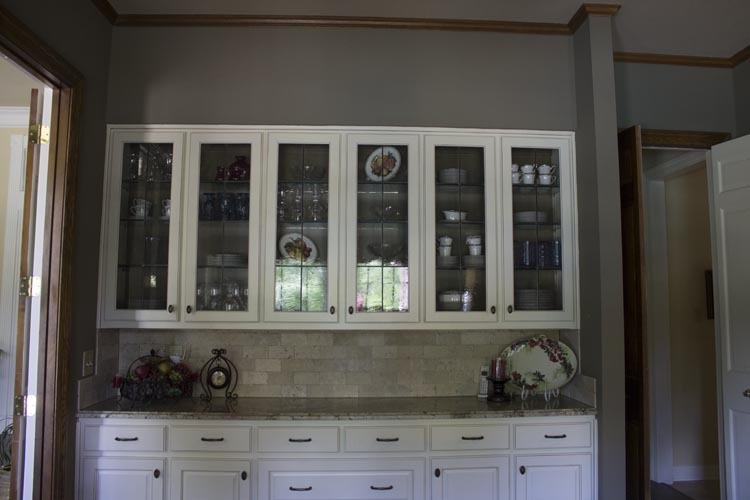 Painted cabinets with glazed-edge highlights really tie the room together, providing ample space for dishes and farmhouse knick knacks alike. The flooring got an upgrade too, where we replaced the old, time-weathered wood flooring with strategically worn Turkish Travertine tiles. Even the island was redone! 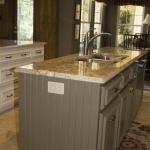 Gorgeous light granite countertop patterns swirl above painted wood paneling, all over smooth cream tiles below. It all plays into the light, airy, farmhouse feeling of the rest of the home. 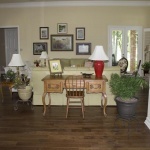 Like this spacious Southern sitting room. Well, maybe just one sitting room, but it’s wide enough to accommodate even the largest Texas farmhouse party! 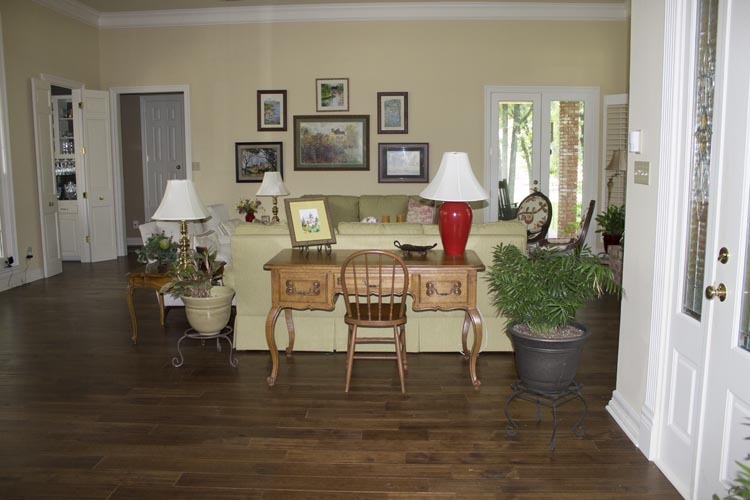 Parties and carpets (even traditional Southern farmhouse parties) just don’t mix, so we put in all new hardwood flooring to make cleanup a breeze. 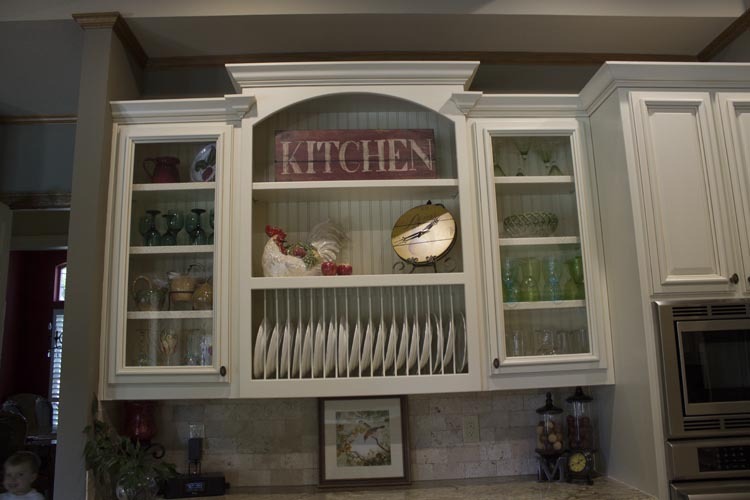 Large single-hung windows with brilliant white shutters make bringing the Southern breeze inside (or keeping the Southern heat outside!) a snap. And let’s not forget the fireplace! With red brick surrounding a traditional painted mantel, you almost feel like you’re back in a Southern farmhouse from summers past. Until you reach the bathroom, that is, where the modern era has swept in and taken ahold. 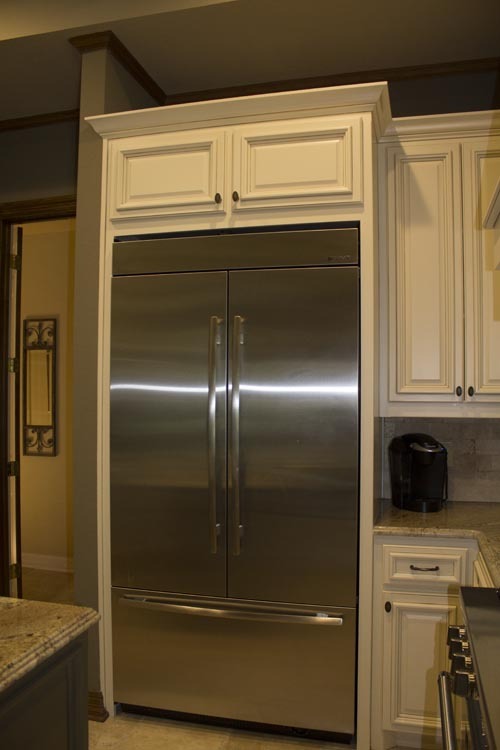 Traditional is nice and all, but sometimes, you just need modern convenience! 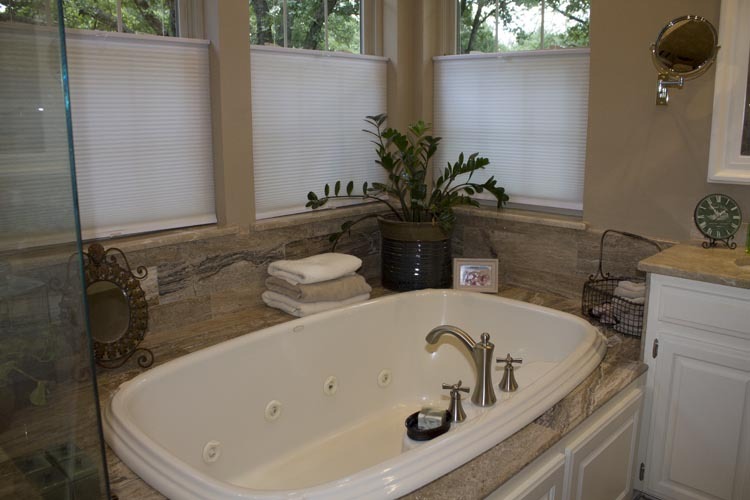 And you can find that in spades in this spacious master bath. We started by ripping out the old flooring, replacing it with the same exotic Turkish Travertine tile found in the kitchen. 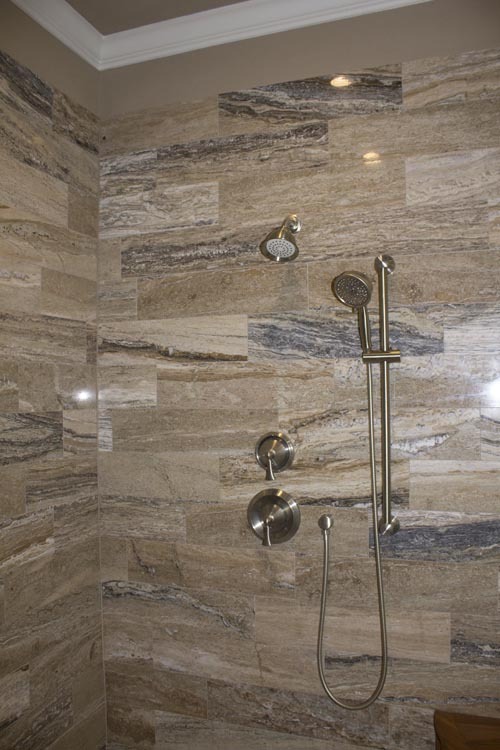 The sumptuous marble walls of the frameless glass shower could only be matched by the stunning granite countertops and skirt nearby. 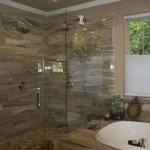 A jacuzzi tub stands ready to envelope you in bubbles at the end of a long day, while his-&-hers vanities sit close by. 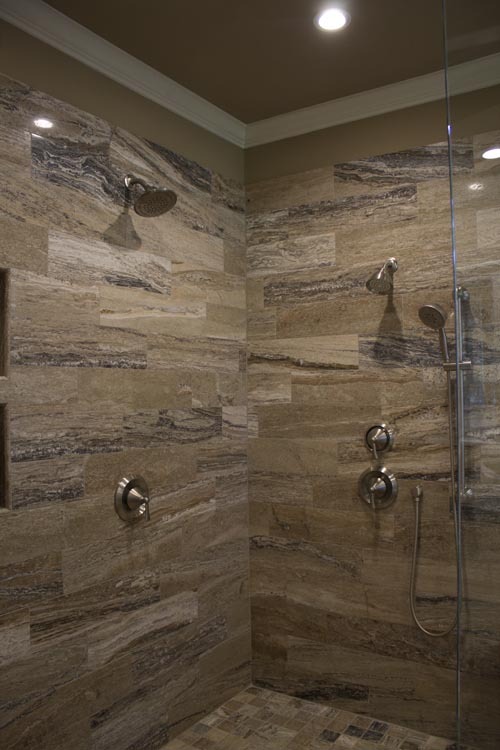 Even the shower is dressed to impress, with a multitude of shower heads and attachments to work out even the hardest knots of stress. 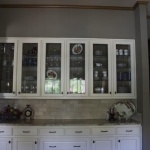 The cabinets too got a makeover, painted a shining white to match the beautiful, thick frames of the mirrors above. But don’t take our word for it — see for yourself! 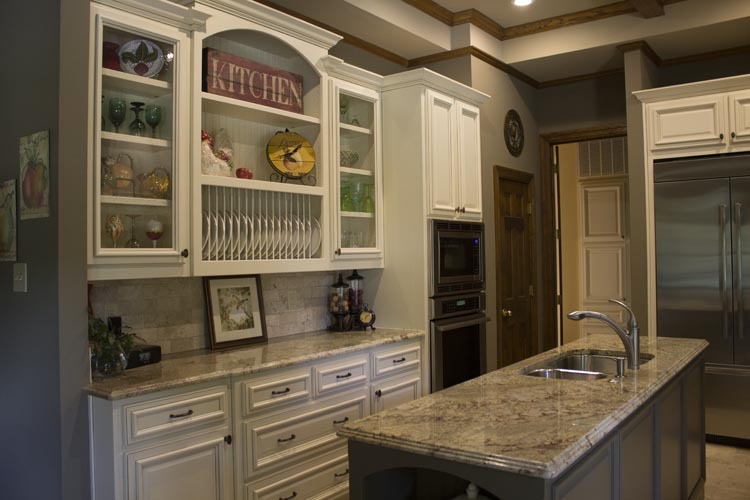 If this kitchen doesn’t say “farmhouse,” we don’t know what does! 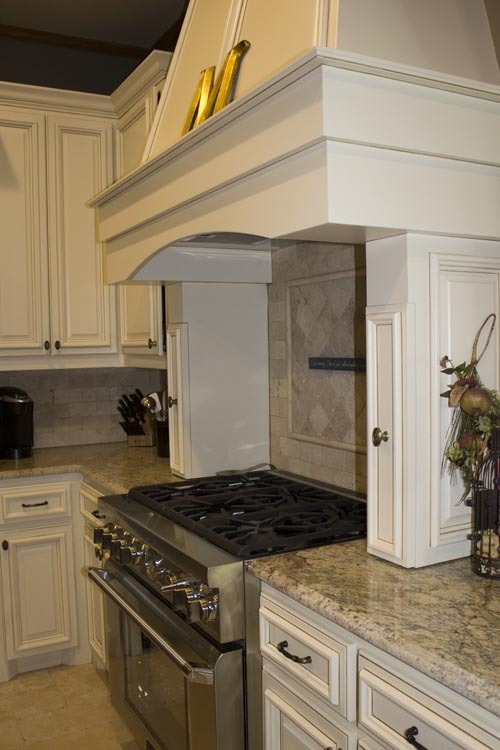 New appliances complement a light cream color scheme, while Turkish Travertine tile aligns with granite countertops for an eclectic feel to an otherwise traditional room. 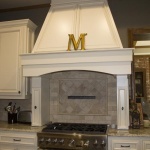 Here’s a pretty thing — a marble tile backsplash! 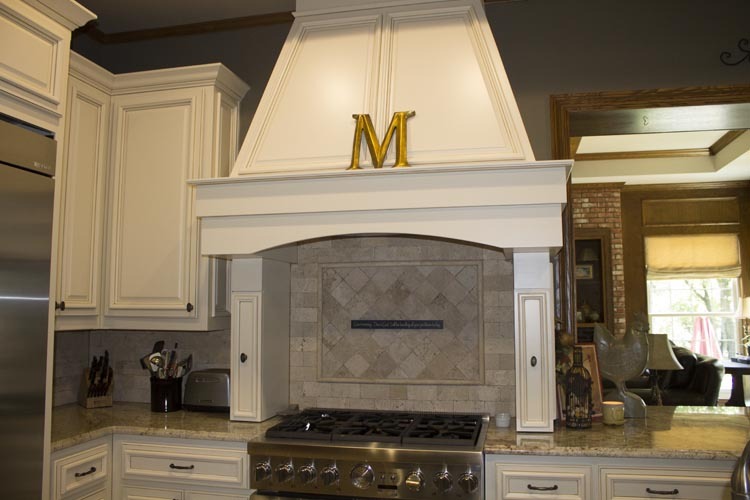 The oversized hood is seamlessly integrated with the rest of the room, and don’t you just love the family’s initial in gold on top? 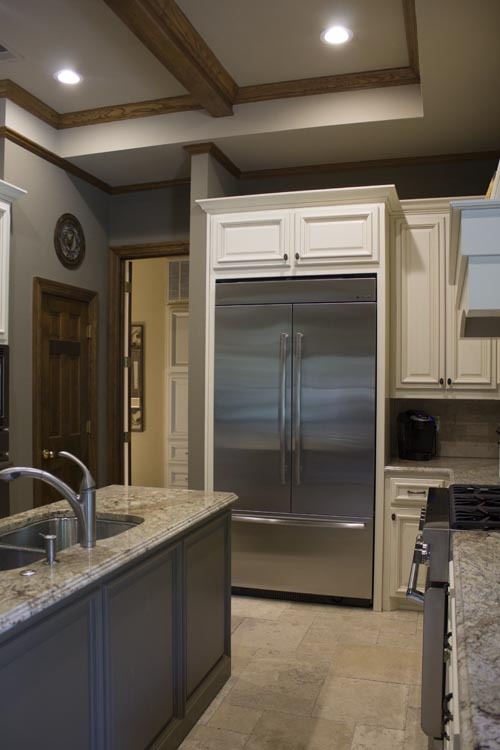 A view from the side reveals just how much room there really is in this kitchen — don’t cook alone, but bring the whole family! 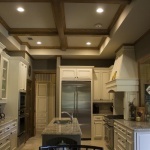 Gorgeous oak beams crisscross the painted ceiling while that Turkish Travertine tile (with chiseled edges, no less) perfectly caps the room. 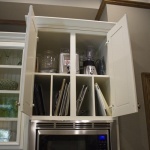 Don’t forget the cabinets! 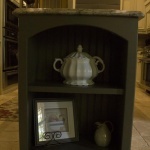 These painted cabinets have glazed highlights on the edges — just a little something unique to draw the eye. 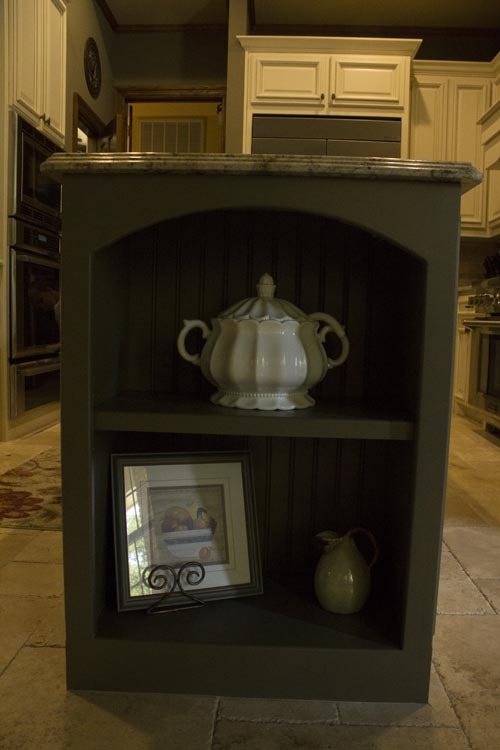 Plates, china, and the occasional knick knack can all find their homes in this painted cabinet — note the marble tile backsplash below. 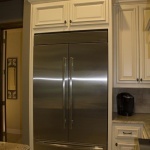 No farmhouse kitchen would be complete without a french door refrigerator! This one’s got room for all the fixins. 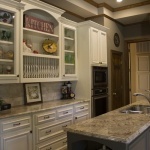 Cabinets, cabinets everywhere! 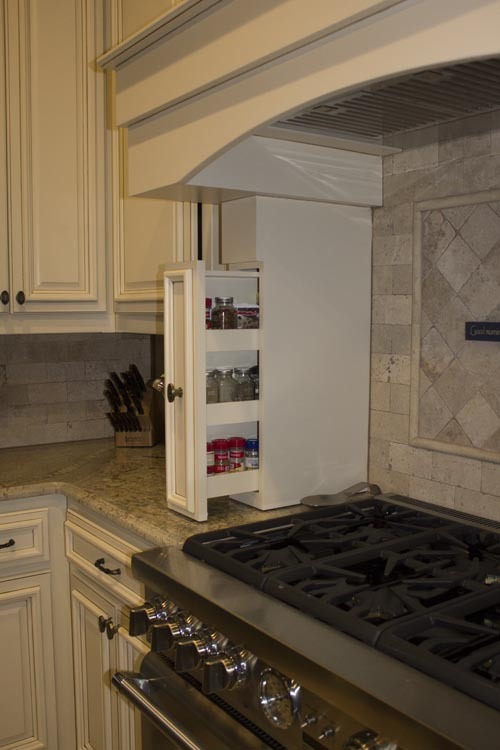 There’s no shortage of storage in this kitchen. 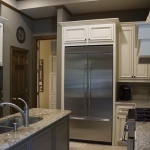 Even the island has room for a few of the comforts of home. 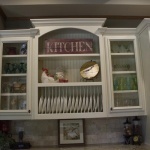 Bet you didn’t notice that on the stove before! 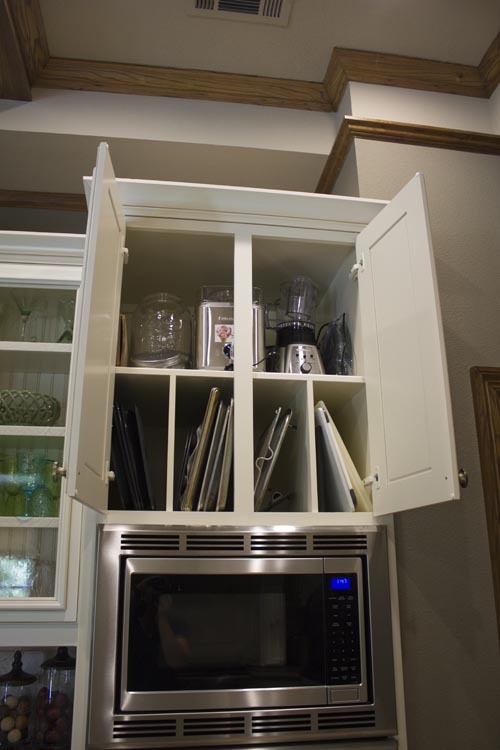 Matching spice drawer pullouts make cooking (and cleanup) a breeze. 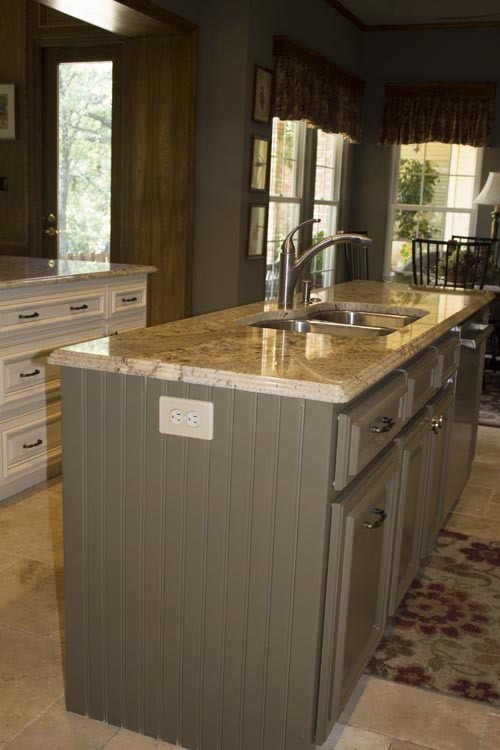 The opposite side of the island pairs subtle wood paneling with a plug or two, a sharp contrast to the gorgeous granite countertops above and Turkish Travertine tiles below. More storage! 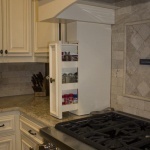 This cabinet just above the oven comes with built-in dividers for cutting boards and appliances alike. 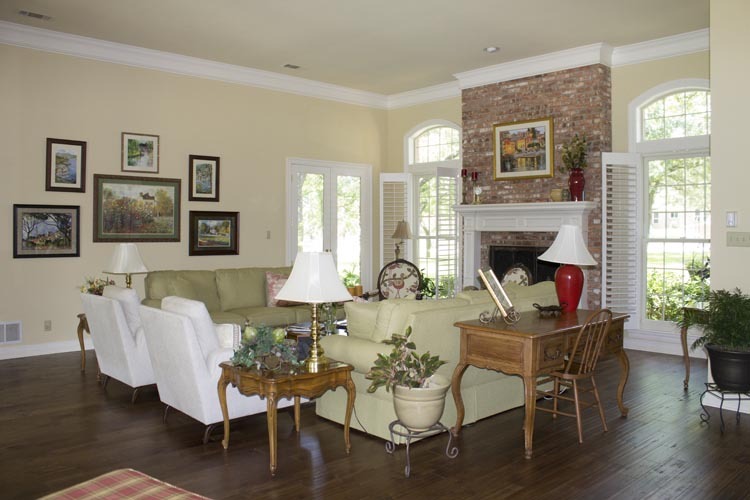 Elegant new wood flooring contrasts with large, single-hung white windows. 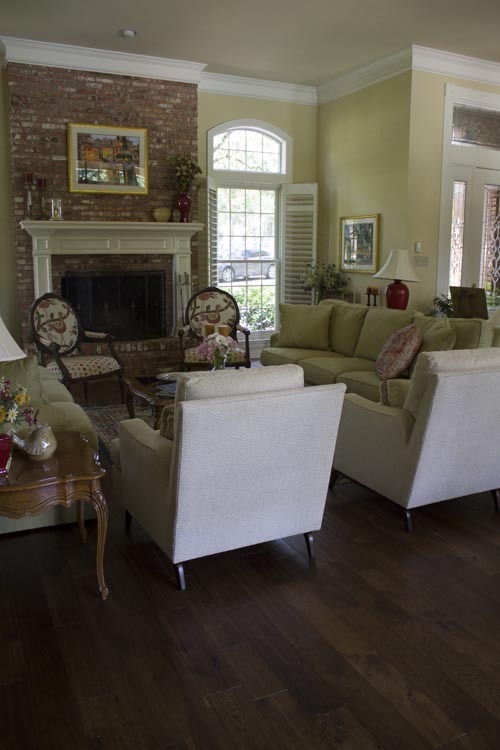 A great fireplace presides over the whole room, with powerful red brick and a white painted mantel. Another view — note the white shutters on those large windows, perfect for letting in the light (or keeping it out). 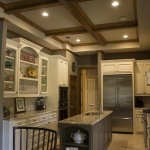 That dark, rich wood is a perfect contrast to the light colors of the rest of the room. 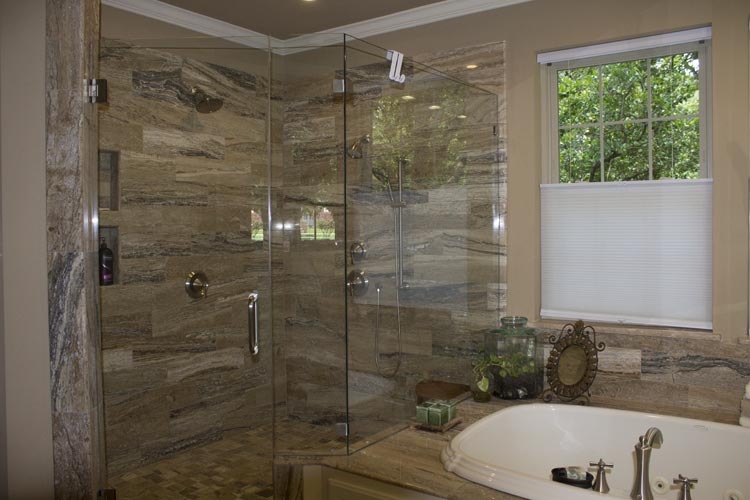 Moving to the master bathroom, we can already see something a little different — a frameless shower and spacious jacuzzi tub bring this house into the modern era. 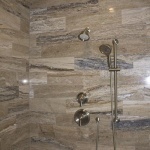 Even the Turkish Travertine tiles look just a bit more modern in this setting (despite their chiseled edges). 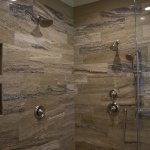 Opulent marble tiles contain showerheads galore — your daily shower just turned into a stress-relieving ritual. Not interested in the mounted shower heads? Just grab this one off the wall! 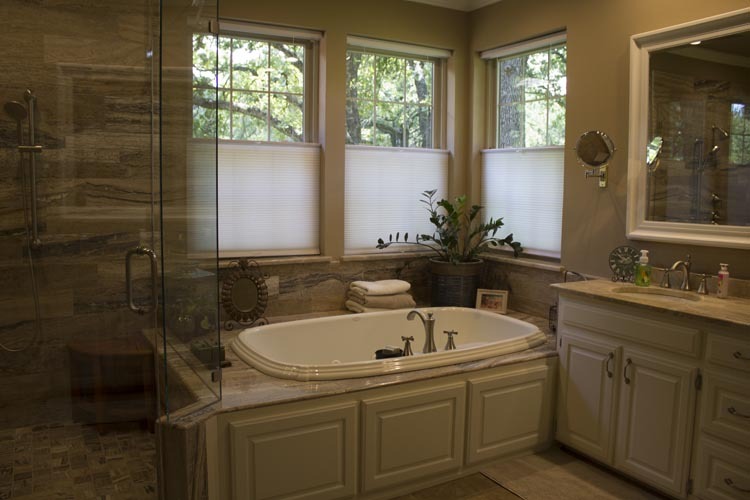 Pull the blinds down for privacy, or stack them at half mast to let the natural light in. 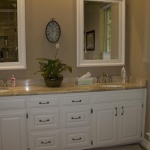 His & hers vanities with thick framed mirrors, stylish granite countertops, and white painted cabinets. 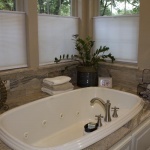 The jacuzzi tub in all its glory! Just imagine melting into the jets at the end of a long day. 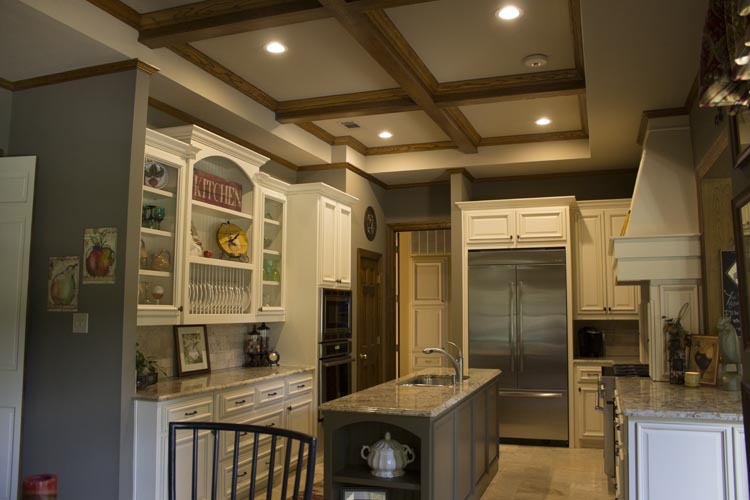 Mixing the old with the new is an old architectural trick, but it works wonders in this house — and the family can now enjoy their old spaces in a brand new light. 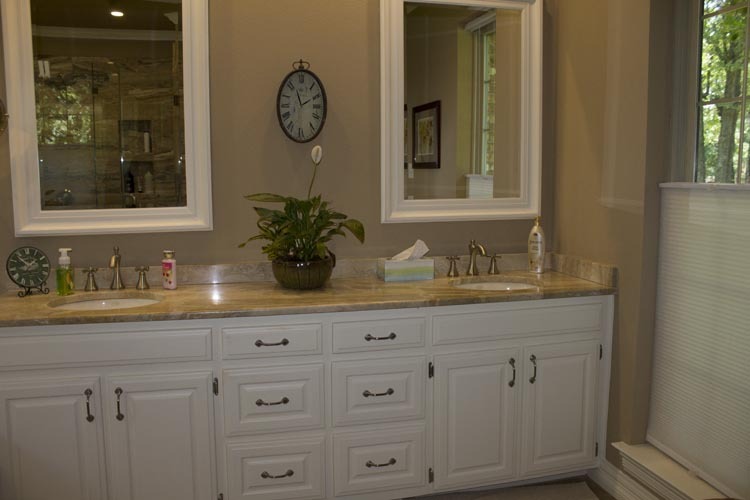 Does your bathroom or kitchen need an update? Do you have a particular style that you’d like to match? We’d love to help!